As December hit, so have a multitude of events in the world of design. In catching up, let me share a quick peek at what’s been on the agenda in New York City just this week so far. 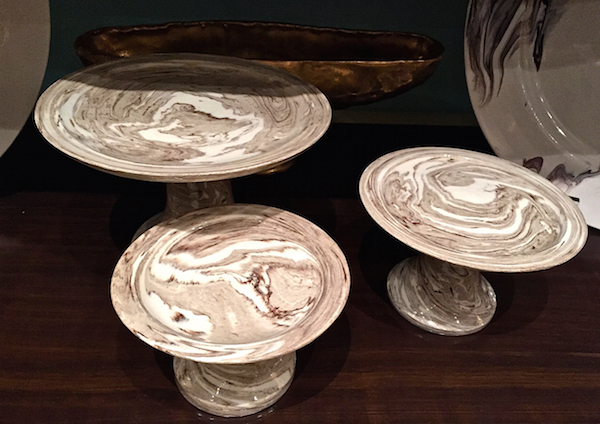 I finally had a chance to stop by Verdura‘s amazing 75th anniversary exhibit, The Power of Style. I’ll be bringing you more from this unprecedented retrospective soon, but I highly recommend paying a visit before the exhibition closes on December 23 (ticket information here). Not only is the jewelry exquisite but the incredible stories associated with Fulco di Verdura, his customers and their commissions represent a history of culture and style in and of themselves. 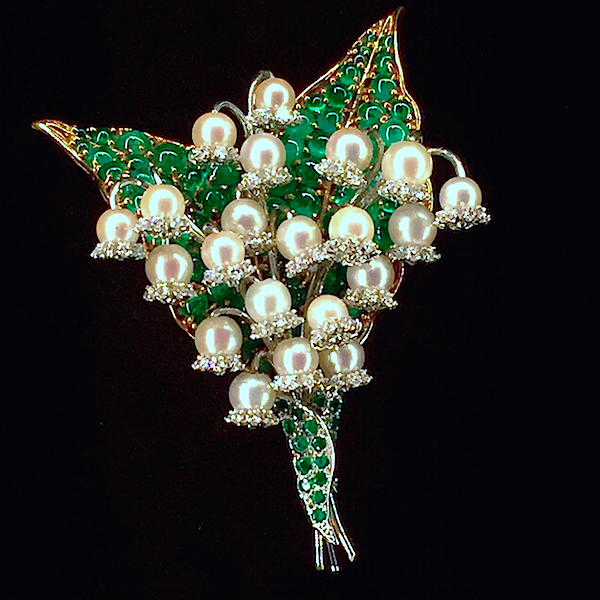 The beautiful “Lily of the Valley” brooch below, for example was commissioned in the 1940’s by Baroness Liliane de Rothschild. It was originally crafted of her children’s baby teeth, which she collected, and have since been replaced by pearls. 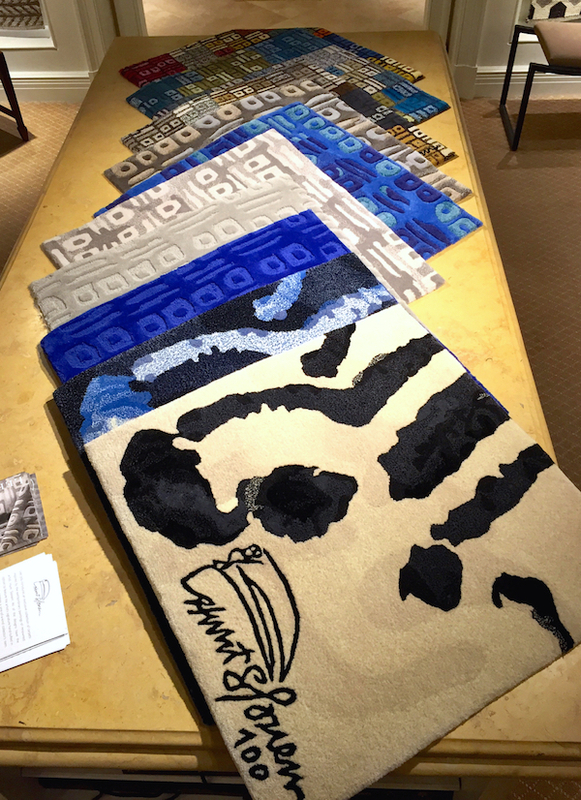 Lee Jofa celebrated the new Hunt Slonem collection for Groundworks in their D&D showroom. Inspired by his love of nature, color and bold expressionist strokes, Slonem’s fabrics, wallpapers and carpets, as well as art now fill the front room. 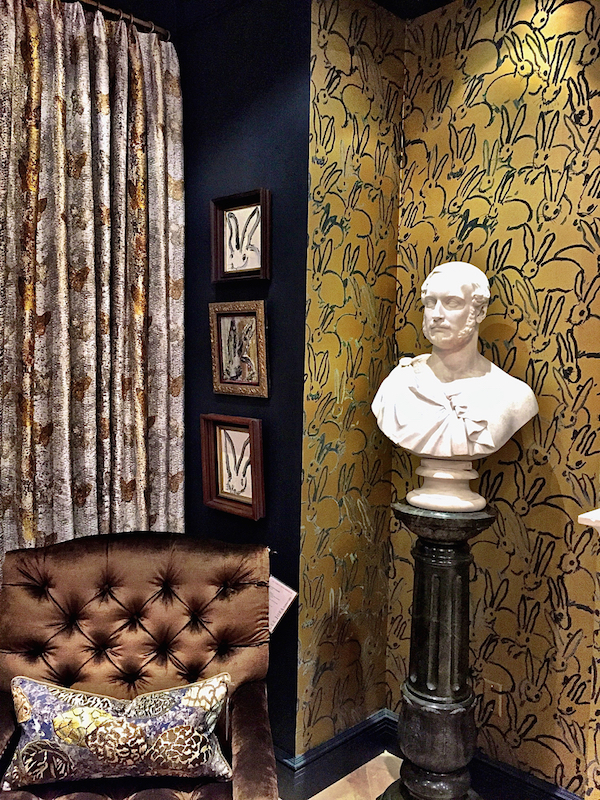 His Hutch wallpaper in gold serves as a lively backdrop for his collections, paintings and refurbished antiques. The more tonal Fritillery on the curtains represents Slonem’s obsession with butterflies with layers of embroidery, woven to emulate his signature cross hatch technique. Fully customizable carpets woven to order in Thailand range from the All Eyes and Plan seen in the front room above to the limited edition Hop Along seen on top below. A video of Susanna’s and my visit to Hunt’s extraordinary studio is coming soon! 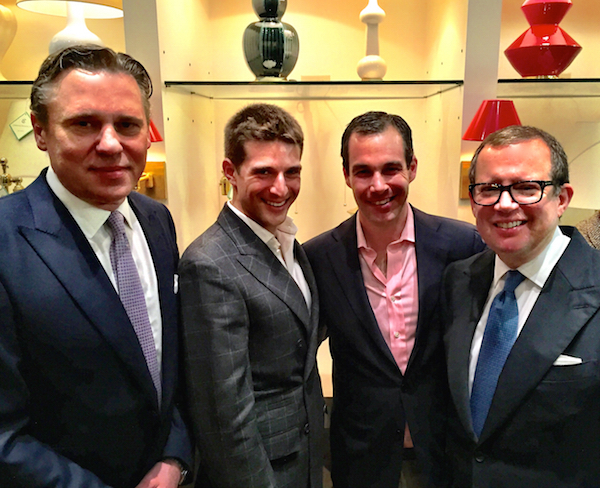 A who’s who in the world of design gathered at the D&D to christen Christopher Spitzmiller‘s chic new space in the building. 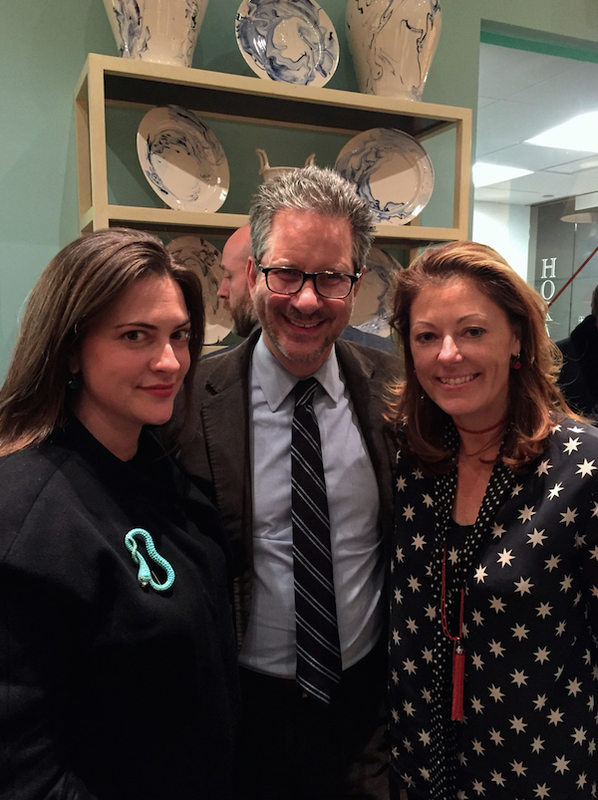 KRB proprietor Kate Rheinstein Brodsky, Elle Decor EIC Michael Boodro and designer Amanda Nisbet, below. 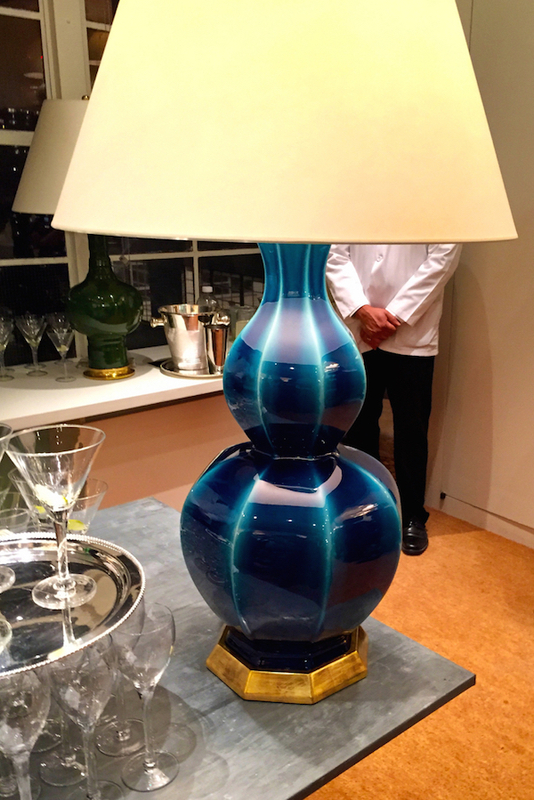 Featuring his gorgeous lamps, tableware and every growing selection of decorative accessories, it is a jewel of a showroom. I am saving my pennies for this new large size Delft lamp in Prussian blue. Chris, second from right, enjoying the debut with, from left, Scott Nelson, Sam Allen and Alex Papachristidis. 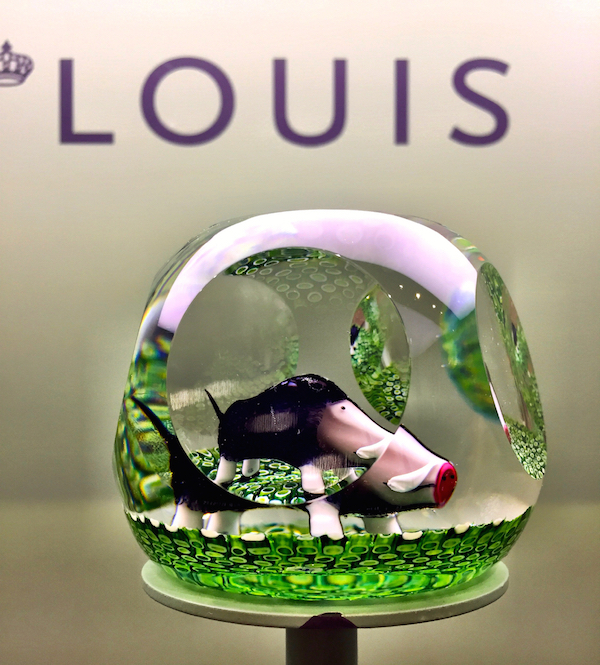 Lastly, was the exhibit of Saint-Louis paperweights at Galerie Dumonteil. We’ll come back to take a closer look at these superb examples of design and craftsmanship. These objets are mini masterpieces representing the skills and heritage of the prestigious crystal works. Below, the Marcassin (Baby Boar) from 2007. The boar, crafted by blowtorch stands on a bed of green rods in a round with five faceted sides. This entry posted in art, design, interior design, jewelry. 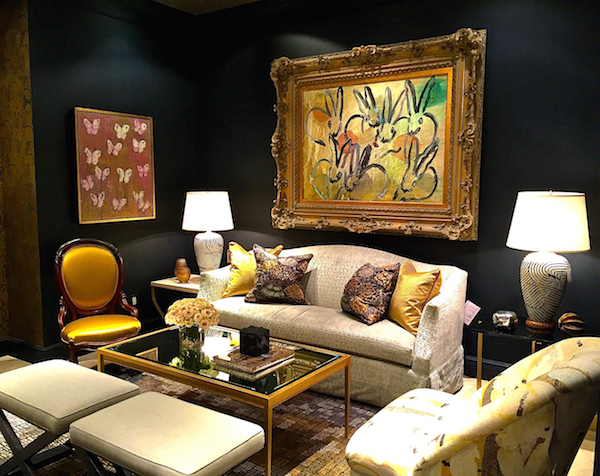 Entry Tags: Christopher Spitzmiller, Hunt Slonem, Jewelry, Lee Sofa, Luxury lifestyle, Power of Style, Saint Louis paperweights, Saint-Louis crystal, Verdura Bookmark the permalink. 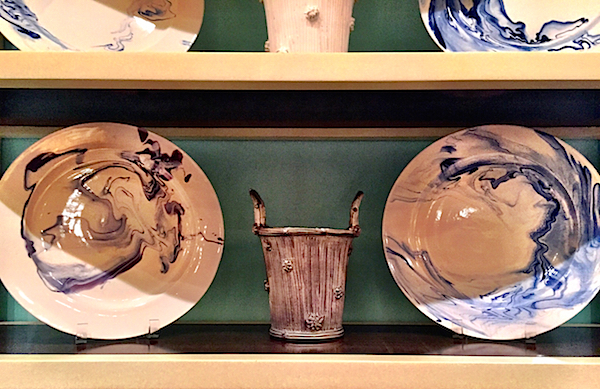 I’ve loved Christopher Spitzmiller’s marbelized dinnerware since I first saw it here, but that cachepot has caught my eye – is it a faux bois design? And I am not going to make it to the city before Christmas so am looking forward to seeing more of the Verdura exhibit! Yes, Phyllis, the cachepot is a fabulous faux bois. He produces a series in a variety of finishes. As always, your design selections are marvelous! Verdura is especially magnificent in craftsmanship and design excellence. And the lamps, dinnerware and carpets are all stunning! 83 queries in 0.486 seconds.